A quinceañera is a very special time in the life of a young Hispanic girl's life. It is the celebration that marks the transition from girl to woman at age fifteen. With the right quinceañera decorations, the mood is set for a memorable celebration to cherish for years to come. A quinceanera is a young woman's first formal party, so the essential decorations often resemble a wedding reception, prom, or other formal and sophisticated event. Arch: The quinceañera celebrant and her father tend to enter the party room under an arch. The arch can be decorated with flowers, ribbons, balloons, chiffon fabric or any other items that match the party theme or colors. Pictures: Prior to the party, the young lady typically has a professional photo shoot wearing her dress. A large framed photo or photo on canvas tends to be one of the decorations. The framed or canvas photo is typically set onto a floor easel. Other pictures of the guest of honor growing up can be scattered around the room as part of the celebration decorations. Cake table: A cake table draped in a linen tablecloth highlights the elaborate quinceañera cake. Other decorations for the cake table can include chiffon draping, tulle draping and flowers. 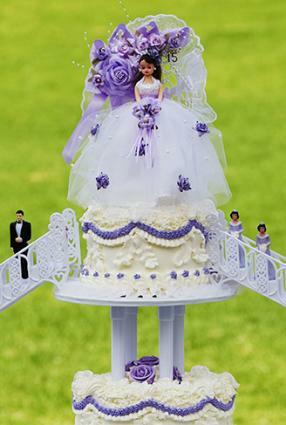 Cake topper: A young woman, castle, or coordinating flowers typically adorns the top of the cake. For cakes that are in a shape, such as a castle, the cake topper can just sit on the cake table next to the cake as a decoration. Guest book: A guest book tends to have its own table, decorated similarly to the cake table, for friends and family members to record their congratulations and best wishes. Candles: Candles are common party elements for lighting the event. Candles can surround table centerpieces or be strategically placed around the room to add ambiance. Ceiling décor: Garlands, balloons, or streamers can be draped from the ceiling to make the entire venue festive and fun. Number 15: To emphasize the young woman's fifteenth birthday, the number can be used in many ways: 15 candles or flowers per table, the number 15 embossed or embroidered on napkins, 15 balloons per cluster, etc. Quinceanera doll: This is a symbolic doll given to the young woman to represent the end of her childhood and it can be displayed with the cake, near the guest of honor's seat, or by the guest book. Zapatillas or high heels: When a girl becomes a woman she can wear high heels for the first time, and glass heel slippers or other decorated shoes can be fun decorative accents. National colors: Subtle details of the party can acknowledge the young woman's national heritage by including the appropriate colors in her gown, floral arrangements, or party favors. Spiritual symbols: A quinceañera is also a spiritual occasion for many, so crosses, rosary beads, and other religious items can be easily integrated into the décor. Use them on the walls or as part of the table decorations. Centerpieces: A centerpiece is used as a focal point for the table. Some girls choose floral centerpieces for each table, often in colors to match the guest of honor's quinceañera dress. Others, however, opt for centerpieces that match the theme. For example, a Cinderella theme quinceañera can have a glass Cinderella coach decorated with greenery or flowers and surrounded by lit candles. 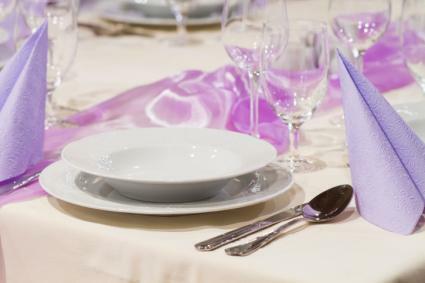 Formal party place settings: Real china and silverware, tablecloths, table overlays, and linen napkins tend to be part of the table decorations. The linens tend to match the color or party theme of the quinceañera. Chair covers: Girls tend to cover the standard banquet or hotel ballroom chairs with linen chair covers that match the table linens. A chiffon bow or a tassel is often tied around the back of the chair as decoration. Some girls include a one-stem flower inside of the bow. Party favors: Party favors, small trinkets to give away to party guests, also tend to decorate the party tables. Favors can vary according to the theme the quinceanera chooses. Chiffon bags of candy, boas, costume jewelry, disposable cameras, and even mini piñatas are all fun options. Depending on the party scope and budget, there are several fun extras that can be included in the quinceañera decorations. The party may have a theme chosen by the young woman - pool parties, garden events, luaus, fantasy settings, and other teen party themes are popular options, each of which requires specialized decorations. A limousine could be rented for the guest of honor and her closest friends and parked outside, adding a statement as guests enter. Roll a red carpet outside and inside to add to the elegance of the occasion. Any of these options add to the overall décor of the event and help make it a once-in-a-lifetime occasion. The best guide for which decorations are appropriate is the guest of honor - it is her party, after all, and her wishes should be honored on this special night. Wedding supply stores and specialized party supply stores are great places to find quinceañera decorations, particularly in Hispanic neighborhoods where the population is more familiar with the customs and traditions of these special parties. Many decorations can even be handmade, and general party retailers can supply basic decorations that can easily be personalized. A quinceañera is a night of magic and promise as a young woman takes her first steps into the adult world in the company of friends and family members. Decorating the event with that formality and sophistication in mind can create an elegant atmosphere that a young woman will remember fondly for many years.